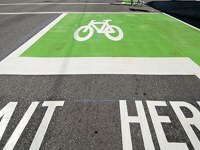 Bike boxes are a new roadway engineering treatment being used by the City of Portland Office of Transportation to improve bike safety at intersections. 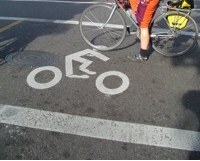 They are intended to improve awareness and visibility of cyclists and to help prevent dangerous “right-hook” collisions. 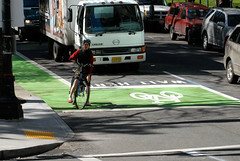 –Listen to BikePortland.org editor Jonathan Maus discuss bike boxes during an interview on the KINK-FM Morning Show. 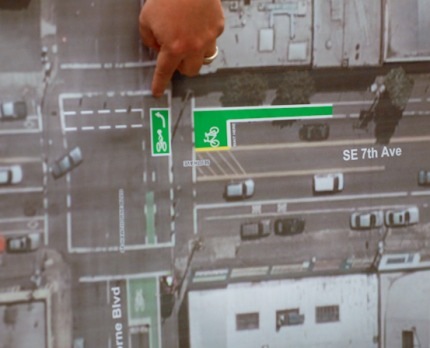 –Listen to City of Portland Traffic Engineer Rob Burchfield talk about bike boxes. 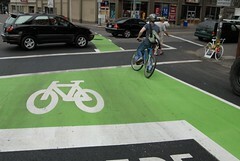 –Visit PDOT’s Bike Box Information page. Click headlines below for full stories. Posted on September 15th, 2010 at 9:25 am. The morning after PBOT called it their #1 priority location to receive a bike box, a woman on a bike was hit at NE Couch and Grand. Based on interviews with the victim’s friend and the driver of the truck, the crash was a classic right hook. According to her friend who was at the scene, Jill Michaelree sustained a broken foot and/or shin and will undergo surgery. Posted on September 14th, 2010 at 6:40 pm. Posted on September 14th, 2010 at 2:51 pm. Posted on April 2nd, 2009 at 12:17 pm. 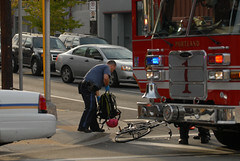 Back in January, we reported that Portland had potentially had a record low number of traffic fatalities in 2008. PBOT has now made it official — we have never had fewer traffic fatalities in any year since they began keeping track in 1925. Posted on November 13th, 2008 at 4:39 pm. Portland has been at the cutting edge of traffic design for many years. In America, with our stringent, car-centric traffic design guidelines, that means having engineers who are not afraid to push the boundaries of the status quo. 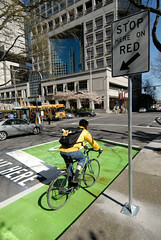 The most recent example of this are Portland’s colored bike boxes. We weren’t the first city to do them, but we were the first to launch several of them at once on busy intersections in the urban core. Posted on October 15th, 2008 at 10:36 am. In 1993 an upstart bike advocacy group called the Bicycle Transportation Alliance — headed by Rex Burkholder (now a Metro councilor) — filed a lawsuit against the City of Portland because of a lack of bicycle facilities around the Rose Garden Arena. 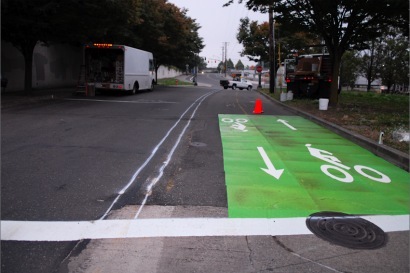 This morning, 15 years after that legal battle (which ended after the BTA backed off two years later, their point being made), PDOT crews (with the blessing of TriMet) began the striping and installation of new bike lanes through the Rose Quarter Transit Center — making passage through the area for bicycles safer, more efficient, and legal. Looking south from NE Holladay. N. Interstate Ave is in the background. Posted on July 28th, 2008 at 3:20 pm. The old-school bike box at SE 39th and Clinton. The colored version at SE Hawthorne and 7th. Posted on July 3rd, 2008 at 10:16 am. 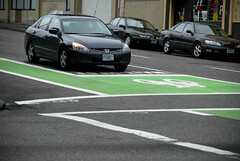 The new bike box at W. Burnside and 14th. On Monday, the city of Portland installed a bike box in the SE corner of W. Burnside and 14th streets in downtown Portland — the same intersection where Tracey Sparling was killed nine months ago. Posted on July 1st, 2008 at 3:17 pm. Posted on June 27th, 2008 at 8:28 am. Clarence Eckerson Jr., that intrepid auteur with New York City-based Streetfilms, just posted another one of the films he made during his recent visit to Portland.